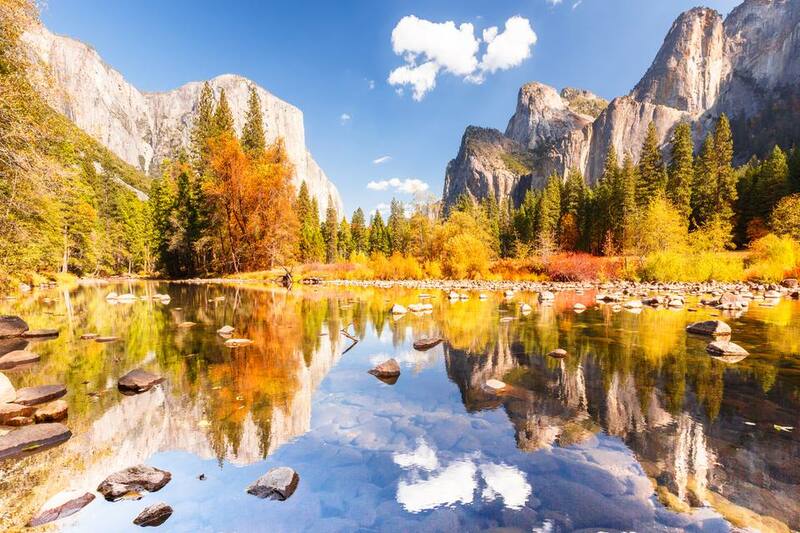 When you go to Yosemite National Park in the fall, you're likely to have mild weather, making autumn one of the nicest times to visit. Cooler temperatures make hiking and rock-climbing more comfortable than in mid-summer. Bikers will not only find it cooler, but the roads are less busy, too. In the fall, because Yosemite Valley is less crowded, hotel rates start to drop at some properties, usually at the end of October. September through December is peak season for trout fishing, especially for brown trout that thrive in the lower Merced River. After the crowds leave, the fish become less wary and easier to catch. Easy places for beginning fishermen include the Hetch-Hetchy Reservoir or Tenaya Lake, accessible from Tioga Road (CA Highway 120). If water levels permit, stream fishermen can also try the Merced headwaters near the Arch Rock entrance on CA Highway 140. For those looking for waterfall scenery, Vernal, Nevada, and Bridalveil waterfalls run all year, but they usually slow to a trickle by the end of summer. Yosemite Falls may still be flowing if it's a wet year, but other waterfalls are likely to be dry. You may find that colorful fall foliage is limited to certain areas in Yosemite. That's because most of the trees are evergreen. In October, the color-turning deciduous trees in Yosemite Valley are photo-worthy, especially the dogwood trees and the maple tree near the chapel. Look for a Ranger-led camera walk. Ranger and nature programs are an ideal way to find subjects for your photos and learn about Yosemite along the way. Some of the best spots to photograph the fall foliage in Yosemite include Tioga Road, along the Merced River and Fern Spring. In Superintendent's Meadow, you can frame a yellow-leafed Black Oak with Half Dome in the background. If you are intent on finding more massive amounts of colorful fall foliage, head east from Yosemite to the forests around June Lake which can be done as a day trip from Yosemite. Many tours continue into fall, including the open-air tram tours and moonlight tours on full-moon nights. The Grand Grape Celebration happens at the Majestic Yosemite Hotel in late fall. This popular program features prominent wineries and industry experts in two and three-day sessions of seminars, panel discussions and wine tasting moderated by wine authorities. A five-course, Gala Vintners' Dinner concludes each session. Reservations are a must. Fall brings the Leonid Meteor showers. They usually occur in mid-November, but you can find out exactly when they'll happen this year at StarDate. During the shower, 10 to 20 meteors fall per hour. The Leonids are at their best when the moon is dark and Yosemite's clear skies will enhance the show even more. Yosemite Theater offers live evening performances mid-May through October. Yosemite weather can be variable any time of year, and although fall is usually mild, there is a chance that early snowstorms can sneak up on you. Following the annual Yosemite weather averages will give a good picture of what the weather is like month by month. Tioga Pass closes when it gets blocked with snow, usually beginning between mid-October and mid-November. To get an idea of the annual variation, you can check previous dates. Glacier Point also closes when the first snow falls. It is important to be aware of road closures, snow reports and river water levels via alerts put out by the National Park Service.